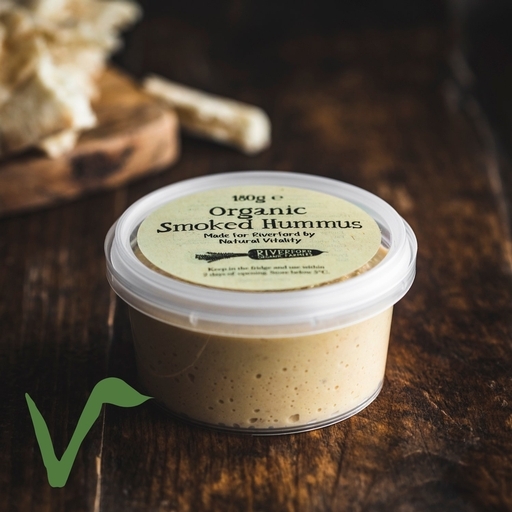 Smoked organic hummus. This rich, creamy blend is made with oak-smoked chickpeas, for an extra smoky depth of flavour. Combined with the best extra virgin olive oil, nutty tahini, garlic, a hint of sharp lemon, and topped with a final drizzle of deep green oil, it makes for a very satisfying spoonful. It may sound strange, but smoked hummus goes particularly well with apple. Simply dunk crisp slices straight in, or grate the apple and wrap in a pitta with a fistful of green leaves and a dollop of hummus. Chickpeas (34.2%), smoked chickpeas (34.2%), filtered water*, extra virgin olive oil, lemon juice, tahini (sesame), garlic purée (garlic, citric acid*), sea salt*.